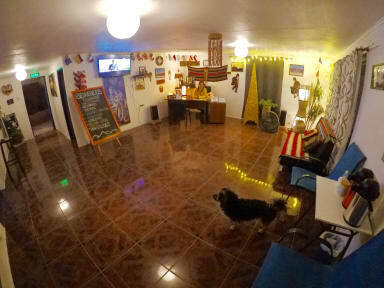 Hostal Possada Atacameña is a cozy and functional hostel that capitalizes its experience in the tourist and hospitality sector to bring the very best of our facilities and town to the guests and travellers. We have shared bathrooms with shared showers (large). And the well-equipped and shared kitchen (large), wifi internet, Lockers, Ping-Pong table,Hammocks, a large garden with a table, BBQ spot and outdoor dining foguera,. Terrace in height to observe the town and the volcanoes. Our facilities are in a privileged location, near to the main landmarks of the city, that can be reached walking. In this sense we are some minutes away walking from El Museo del Meteorito, Whipala expedition and San Pedro de Atacama Church, amongst other interesting spots of our town. Furthermore, the hostel is located in a corner next to the Indian archaeological cemetery and in front of Fire Department. We have a big hostel, with eight rooms, five of them with private bathroom. We offer different types of accommodation to suit the needs of diverse sort of guests and travellers. In this sense, we have dorms for the most venturesome travellers as well as private accommodation for those guests who are seeking for some tranquillity and quietness. In addition, we have common areas in which the guests and travellers are going to able to exchange past experiences and future plans. The reception is open from 08.00 to 23.30.